The Accounts tab displays current account information in a data grid. The account values that are displayed is dependent on your connectivity provider. Not all connectivity providers transmit complete account data. 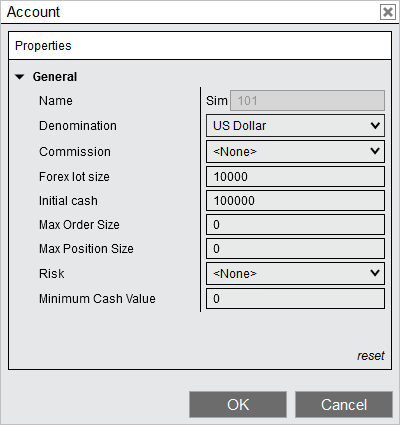 *Sets what currency to display the account values. Must be set to the currency the account is in. 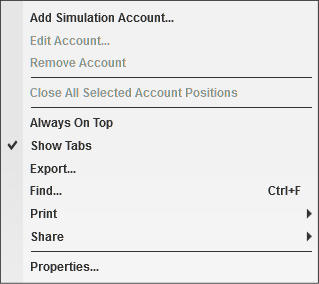 The Playback101 account cannot be edited, it inherits its settings from the Sim101. Adjusting the denomination requires a reconnect. *Some providers will always display the denomination in US Dollars. Not all properties display for all accounts. The account values that are displayed depend upon your connectivity provider. Some connectivity providers transmit partial account data, while others do not transmit anything. Below is a table of the various account values displayed by different connectivity providers. 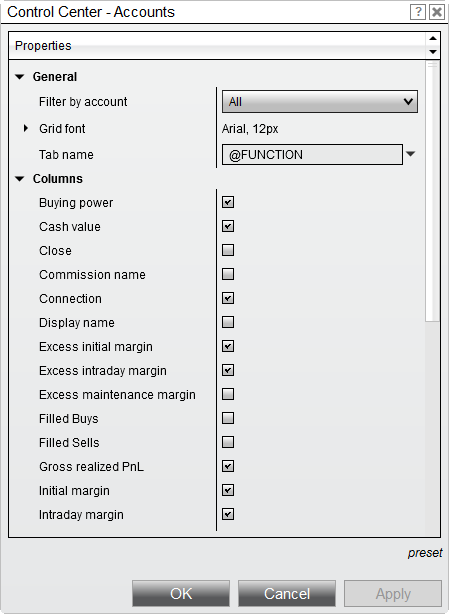 •If a Connectivity Provider supplies Unrealized PnL in NinjaTrader, but a risk template is applied (example: local simulation accounts) the Unrealized PnL will be calculated locally. •Interactive Brokers reports forex trades in the instrument currency, not the account currency, without commissions applied. So, forex trades are not applied to Realized PnL. •If a commissions template is applied, values will include commissions, locally calculated. NinjaTrader will attempt to convert currency for forex and futures trader. •Forex trades will be made for any currency pair that has a cross rate and that cross rate data is available on your data feed. •Futures trades we use the CME FX futures (6A, 6B, 6E, etc) to make the conversion as long as you have access to that data from your data feed provider. •Commissions in the Account tab are calculated based on the Commission Template applied to the account in your installation of NinjaTrader, and not pulled from any Data Provider. •Due to the CME FX Futures being mostly limited to US cross rates conversion will only occur to US Dollar account denomination for futures trades. Sets that columns are enabled or disabled in the accounts grid.